Money laundering and other forms of corruption have become the subject of intense interest. Governments and legislative bodies have introduced – or more rigorously enforced / measures to stop the flow of proceeds from illegal activities estimated at US$ 1.5 trillion per year, some 2-5% of the world’s GDP. 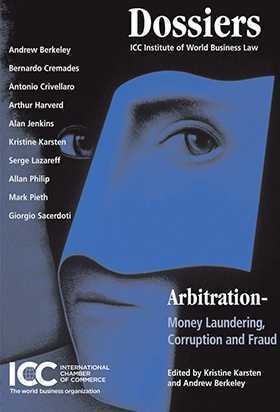 Arbitration – Money laundering, Corruption and Fraud – compiled by the world renowned ICC Institute of World Business Law, where legal and business experts convene, and edited by eminent lawyers in the field – focusses both on the nature of the problem and the lawyer/arbitrator’s response to it. This useful Dossier by the Institute brings the reader the expertise of lawyers, academicians and accountants from a range of countries, and addresses the key questions arbitrators and legal practitioners want answered. It is organized to give a comprehensive overview of the problems and the solutions available, and concentrates directly on the issues raised for arbitrators by money laundering, fraud and bribery. The ICC Institute of World Business Law brings together the finest legal minds to strengthen links between international business practitioners and the legal profession. The Institute’s ‘Dossiers’ is a series that has gained international prestige. These Dossiers are the outcome of the Institute’s annual meetings, where experts from around the globe come together to discuss salient issues of international commercial law and arbitration. An ICC Services publication, distributed by Kluwer Law International.